Collection of John Pratt, 1st Marquess of Camden (1759-1840). His sale, London, Christie’s, June 12, 1841, lot 28: “WATTEAU . . . AN ENCAMPMENT, a sketch; an undoubted work of this very rare master.” The painting sold for £40.19 to Sir Edward Sugden, according to an annotated copy of the catalogue in the Rijksbureau voor Kunsthistorische Documentatie. London, collection of Edward Sugden, 1st Baron St Leonards (1781-1875). London, collection of T. Humphrey Ward (1845-1926). Paris, collection of Rodolphe Kann (1845-1905, investment banker) prior to 1900. At his death in 1905 Kann’s collection was given to Duveen and others for sale. London, with Baron Joseph Duveen (1869-1939); Catalogue Kann Collection, pl. 159. Paris (Neuilly), collection of David David-Weill (1871-1952, investment banker), acquired prior to 1922; Henriot, La Collection David-Well (1926), 1: 389. Paris, collection of Pierre David-Weill 1900-1975, investment banker), c. 1952. Paris and New York, with Wildenstein and Co., c. 1956. London, Grafton Galleries, National Loan Exhibition (1909), cat. 13 (as by Watteau, Camp Scene, lent by Messrs. Duveen). Montreal, Museum, Eighteenth Century Art (1950), cat. 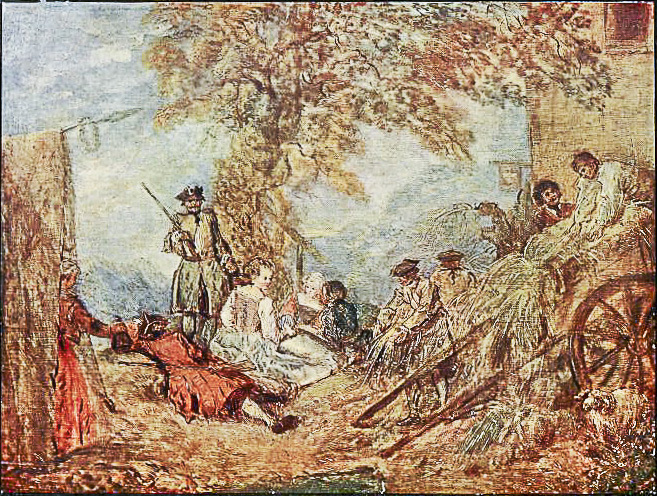 42 (as by Watteau, Scène de camp, lent by Pierre David-Weill). Paris, Gazette des beaux-arts, De Watteau à Prud’hon (1956), cat. 93 (as by Watteau, Le Campement, lent by Messrs. Wildenstein). Bode, Gemäldesammlung Kann (1900), pl. 93. Catalogue of the Rodolphe Kann Collection (1907):Tableaux:2, 68-69. Nicolle, “L’Exposition nationale” (1910), 58. Zimmermann, Watteau (1912), pl. 38. Henriot, Collection David Weill (1926), 389-90. Dacier, Vuaflart, and Hérold, Jean de Jullienne et les graveurs, under cat. 125. Réau, “Watteau” (1929), cat. 51. Adhémar, Watteau (1950), cat. 274. Macchia and Montagni, L’opera completa di Watteau (1968), cat. 5o-B. Like so many other works optimistically ascribed to Watteau in the nineteenth and early twentieth centuries, this picture has rightfully been withdrawn from the canon of his paintings. It was accepted by Zimmerman, Réau, and Dacier and Vuaflart. While it was in favor, it was presumed that it was another of the many military subjects that he painted around 1709. However, matters changed after World War II. Adhémar proposed that it was by François Jerome Chantereau, a Watteau satellites to whom she wrongly assigned several other military subjects previously associated with Watteau. Even Macchia and Montagni, who aped her opinions in most all instances, followed her only in rejecting this painting from Watteau’s oeuvre but they ascribed it just vaguely to one of Watteau’s “immediate followers.” Her attribution has not been followed by subsequent Watteau or Chantereau scholars. Anonymous artist, Scène de camp militaire. Jean-Baptiste Pater, Le Campement, 62 x 75 cm, oil on canvas. Whereabouts unknown. In fact, Scène de campe militaire copies a composition by Pater that has been exhibited and sold on the Paris market several times in the last half century, most recently at the Hôtel Drouot, May 4, 2012, lot 21. Pater’s painting is more than twice as large but there are only minor differences between the two in terms of composition. Pater anchored the left side with a tree in the foreground, and in the middleground a scene of two women outside a tent. The anonymous artist responsible for Scène de campe militaire has moved the tent to the foreground and added a woman emerging from it. Her posture is remarkably wooden. Pater’s elegant soldier at the center of the composition has been replaced by an awkwardly posed soldier, carrying a rifle over his shoulder in a most unconvincing way. In place of Pater’s foreground tree and lesser elements of foliage at the right, our copyist has inserted a large tree at the center of the composition. Whereas Pater’s work is highly finished, our picture is rendered loosely and has often been described as just a sketch. Pater frequently made painted sketches, not as preliminary modelli but as ends in themselves, as works to be sold on the market. However, and not a minor consideration, this picture is inferior in quality to Pater’s sketches. In particular, the soldier at the center is gauche and ill conceived. While it is evident that the Scène de campe militaire cannot be attributed to Pater himself, the questions of when this work was created and to which Pater follower or imitator it can be ascribed remain moot issues. Our discovery that it can be traced to the first decades of the nineteenth century is significant in this regard, and given the Marquess of Camden’s longevity, there is the possibility that it someday may be traced back to at least the late eighteenth century. 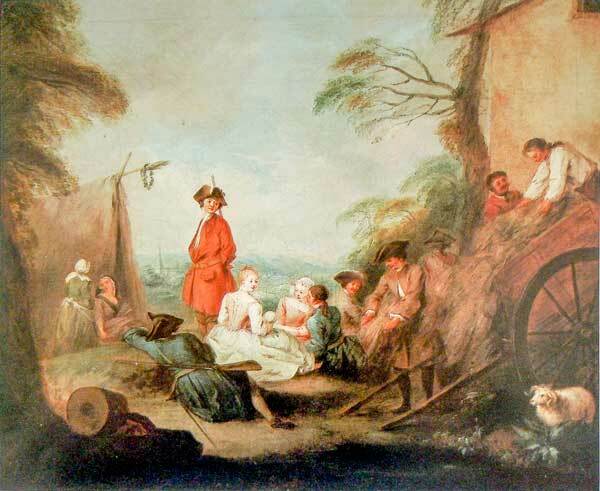 A number of paintings attributed to Watteau and described as “encampments” were sold in London in the period between 1790 and 1815, but we have not found any yet with the telling notation that they were sketches.